Hello drones lovers! Here is the video of our first humanitarian mission with Drone Adventures. 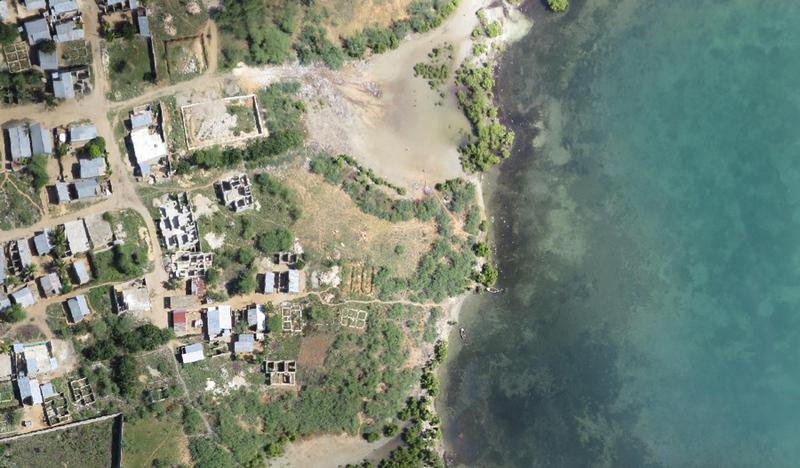 We went to Haiti to explore the potential uses of drones to map encampments, riverbeds and entire villages. Have you ever wondered how important it is to have detailed and up-to-date maps of a territory? In the age of the smartphone, it’s easy to take high-resolution satellite images for granted. But what happens when a natural disaster (such as an earthquake or an hurricane) changes the landscape of an entire city in just a few minutes? How can rescue teams search for survivours when satellite images no longer represent the state of a city? How can organisations distribute aid and coordinate reconstruction of dense urban areas that expand and change on a daily basis? They have an artificial intelligence on-board that allows them to fly autonomously and take “flight decisions” (example: my battery is too low, better go back and land now). They are equipped with sensors for monitoring the flight in real time (GPS, altimeter, wind-speed sensor, …). They have a “payload” used to deliver a service; in the case of mapping it’s a camera used to take pictures of the ground from the sky. Small and lightweight drones are capable of mapping areas of several square kilometers in high resolution on demand and can be deployed within minutes. The photos collected by the drone are then automatically processed, or “stitched” together, into a precise GPS-referenced map and even into a 3D model of the territory. Within a few hours this map can be in the hands of rescuers or aid workers on the ground, where it’s needed most, at a fraction of the time and cost of satellite imagery. 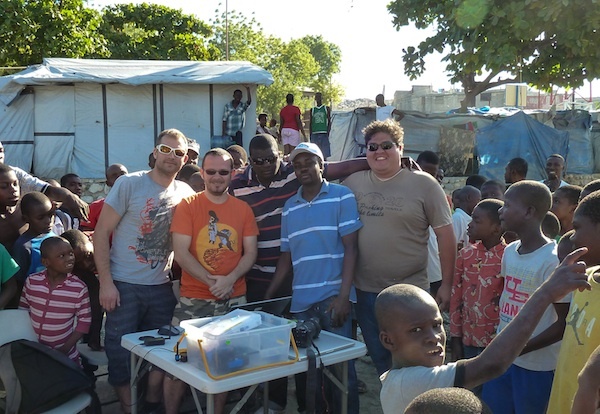 In April 2013 Drone Adventures sent two of its members, Adam and Emanuele, on a mission to Haiti to demonstrate the effectiveness of drone technology in humanitarian aid. This wonderful region has endured several natural disasters in recent years, including a terrible earthquake at the beginning of 2010, a violent cholera epidemic at the end of 2010 and the infamous Hurricane Sandy at the end of 2012. Every disaster not only results in casualties but also continuously changes the landscape of the country; buildings and roads are constantly destroyed while refugees flood the cities and inhabit growing encampments. There is a continuous need for up-to-date imagery for aid distribution, reconstruction, disaster mitigation…the list goes on. 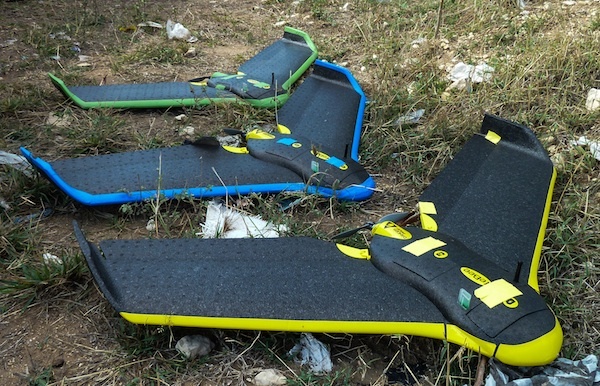 We arrived in Haiti with three eBee drones by senseFly, a stack of computers running Pix4UAV by Pix4D and open minds. 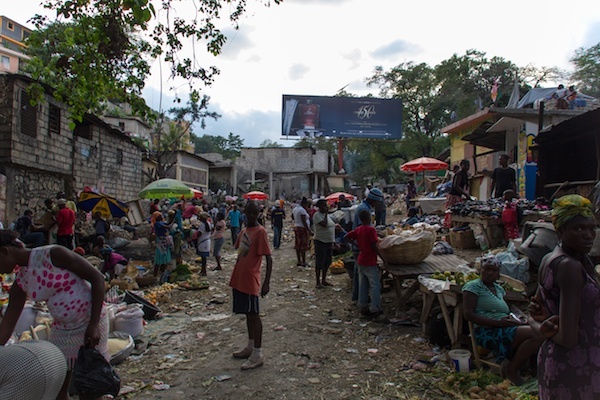 During our 10 days in the country we worked closely with our partners, IOM (International Organization for Migration) and Open Street Map, two organisations that have years of experience on the ground in Haiti. Mapping of several dense shantytowns in Port-au-Prince, used to count the number of tents and organize a “door-to-door” census of the population, the first step in identifying aid requirements and organizing more permanent infrastructure. 3D terrain models of some dangerous ravine beds will be used to perform water-flow simulations and decide where to build infrastructure to mitigate flooding. The picture below for example shows the riverbed of the Millet River in the south of Port-au-Prince. When dry, it is used as a market for the local encampment. Within 10-15 minutes of rain, however, the entire riverbed is flooded. 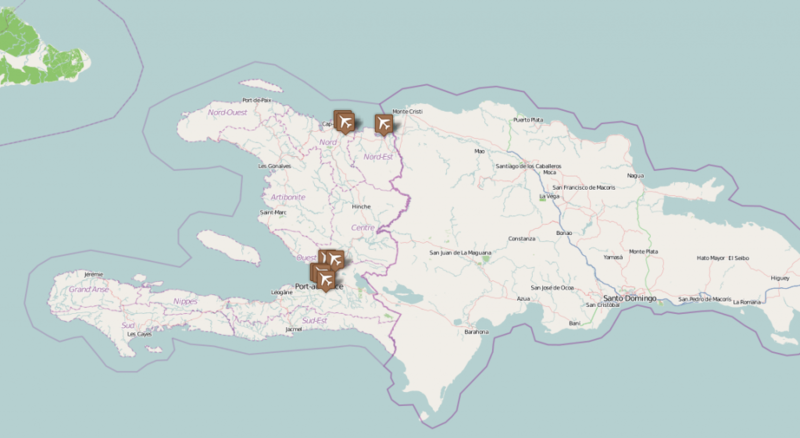 2D and 3D maps of the brand-new University of Limonade in the north of Haiti to help promote the school for the next generation of youth of Haiti. All the data that we generated has been made freely available through OpenStreetMap to all the great people we met during this mission, without whom this mission would not have been possible. Have a look at the map below, and zoom in to see the mosaics of the zones that were mapped! You can also see the 3D results of some zones by clicking the layers in the top-right corner. Besides mapping, our Drone Adventures delegation trained local surveyors and geographers to use drones and held a seminar explaining the potentials of the technology to members of other aid agencies. In the hands of skilled locals, drones can be an empowering tool to aid in the development of their country. Our trip to Haiti is just the first of many different project we are organizing. We truly believe that drones can have a huge impact in the development of our society. 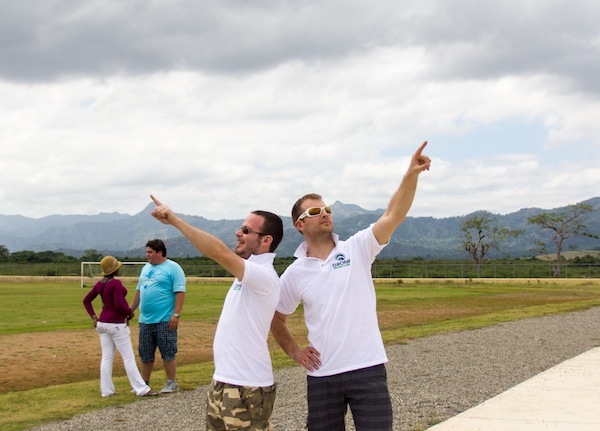 Keep following us on our website and see you at the next Drone Adventure! Here’s a picture of the whole team including Emanuele and me from Drone Adventures, Mario, Presler and Sebastien from our support team from IOM. Finally we wish to thank senseFly and Pix4D for all their support, before, during and after our mission.